Guest writer Michael Gray here to talk about comics, a popular topic here on Exfanding Your Horizons. I'm not going to talk about comic books, though, because I don't really read them. My area of comics expertise isn't comic books; it's pre-1950s newspaper cartoons. Earlier in this blog, Alex said that it's kind of hard to pin down an exact date for the end of the Golden Era of Comics. Well, let me make it a bit simpler for everyone. That's the year comics stopped being good. But before I explain why 1948 is the year comics went bad, let me explain why I think comics prior to that time were good. Today, newspaper comics strips are four inches wide, which is kind of small. 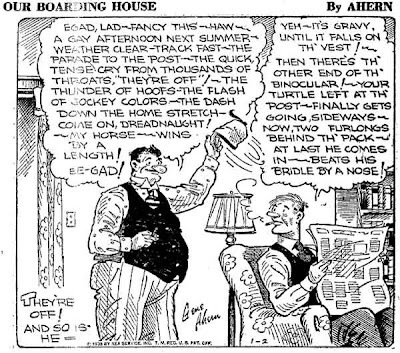 Back in the 1930's and 40's, newspaper comic strips were TWELVE inches wide. Yes, you read that correctly. They were three times are large as they are now; the standard policy was to have a strip run all the way from the left-hand side of the newspaper page all the way to the right-hand side. So naturally, the comics were better, because the artists had more room to work with. This is a 1930s Boots and Her Buddies comic. Notice how it is larger than my entire forearm and hand. As a bonus, bigger strip sizes meant the artwork tended to be better. It's really hard to get away with bad artwork in a medium which is so art-heavy. You couldn't get away with the drawing "shortcuts" that cartoonists take today, such as not drawing backgrounds or drawing the characters in the same pose in every single strip. That looks really bad and screams "Incompetent Artist," who usually ended up becoming an "Out-of-Work Artist." This is a 2010 Jump Start comic. Notice how it is smaller than my hand. There are two kinds of comic strips: joke-a-day strips (like Garfield), and storyline strips (like Rex Morgan). Open up the comics page today, and you'll see that 90% of the strips are all joke-a-day, whereas two of them are storyline strips that are older than your grandmother. Back in the Golden Era of Newspaper Comics, the exact opposite situation was the case. 90% of the strips had running storylines. Only two of were joke-a-day strips. That's a reason why the Golden Era was good; comic strips were expected to have storylines with character development and interesting things like that. Whereas today, people distinctly do not want those elements in comic strips; they just want a quick laugh that doesn't involve having to think, thank you very much. Interestingly enough, the strips were apparently so plot-heavy in the 1930s that my local newspaper decided to only run them on Sundays. That way, they could conveniently put the whole week's worth of strips on one page, so you could get the entire week's plot at once, instead of having to tune in every day to see the plot develop. I always thought that was an interesting way to go about presenting a storyline strip. This was later replaced by a full-color Sunday comics page, of course. On a side note, this is why I stopped liking Calvin and Hobbes once Bill Watterson changed the layouts of the Sunday strips. I liked reading the week-long or month-long storylines where Calvin got into adventures with his time machine or evil clones, or when he flew to Mars. Those were really fun. But when Watterson switched the Sunday strip format, he sort of stopped writing long storylines and mostly did joke-a-day strips. It disappointed me. In the golden age, the target audience for newspaper comics was mainly adults. This is because, thanks to the Great Depression, only adults could afford newspapers. Most strips were geared toward the target audience of adults, so naturally, the quality level was generally higher, and the types of storylines you saw were vastly different from the types you see today. Note that I am not thinking of adult-oriented cartoons like the ones you see nowdays on Family Guy or Comedy Central. I am not sure why these shows are rated "M" for "Mature Audiences," when most of the jokes involve immature third-grade topics like farting and urination. No, here, I'm thinking of something like The Odyssey. That's a masterpiece of literature, but it's adult-oriented in that the dramatic ending where Odysseus slaughters over a hundred suitors is not exactly "kid-friendly" material. The odds of you reading a newspaper cartoon today with a plot like that are zero to zero. But back in the Golden Age, people could and did write plots like that. Believe it or not, Little Orphan Annie ran two (TWO!) Odyssey-esque series, in which over a hundred people were slaughtered at once, and the various characters debated the morality of the situation by touching on deep themes like life, death, and duty. Granted, those Orphan Annie plotlines did generate a TON of hate mail and complaints, but the point I'm trying to make is that they could at least run a plotline like that, without it being censored to death. Today, of course, society at large thinks comics are just for kids, which has caused the comics industry no small amount of stress. The Golden Era of Comics took place before television was invented. Television kind of destroyed people's attention spans and tolerance for reading in general, but since the Golden Era was pre-TV, people were willing to read long strips with lots of dialogue. The best example (and worst offender) is "Our Boarding House", which is a strip that had so much dialogue that there was barely any room for pictures. The amount of dialogue in each panel was about the size of this paragraph. All right, I think that's enough about why comics from back then are good. What happened in 1948 to change this? I'm not sure, but apparently someone (I'm told his name is Fredric Wertham) decided that comics should be just for children, so they did away with all the things that I just said made comics good. My local newspaper, The San Jose Mercury-Herald changed its comic page in 1948. Previously, they ran half of the paper's strips in the morning edition and the other half ran in the evening edition, presumably in order to get people to buy both editions. I'm pretty sure that plan didn't work, because the evening edition strips were the ::ahem:: not-so-good ones. 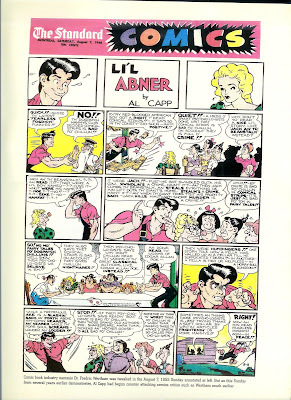 So in 1948, the two comics pages were combined into one. Clearly, the intelligent move would have been to keep all of the comics the way they were previously, but that's not what happened. 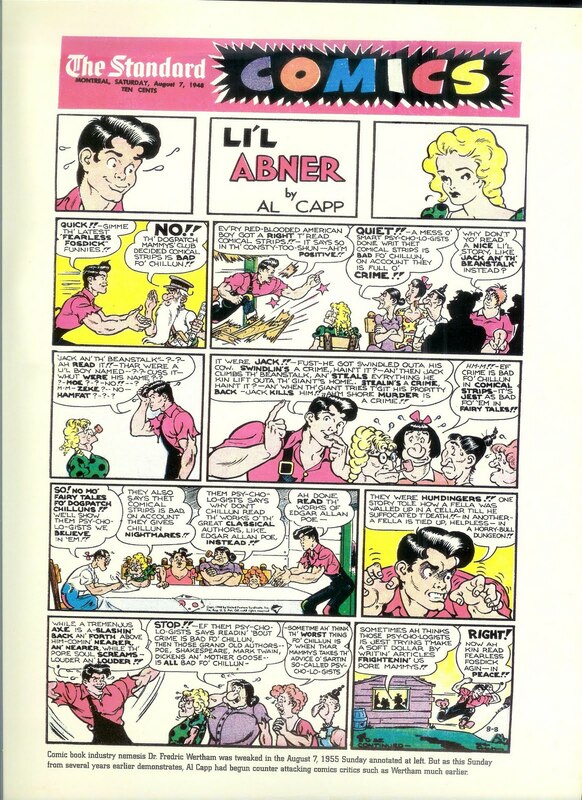 Instead, they shrunk all of the comic strips to save space, which made them much harder to reader. This spelled death for the more text-heavy strips like our aforementioned friend, Our Boarding House. In fact, most of the storyline strips were dropped, and they were replaced by joke-a-day strips like Penny (a teenage strip, like Luann or Zits). It was a clear message: baby boomers wanted smaller, joke-a-day strips for their kids to read, not the larger, plot-based strips they used to read. This is not limited to my local newspaper; in fact, in 1948, Little Orphan Annie was dropped from several hundred newspapers overnight, under the pretext that it was inappropriate for children. Harold Gray retailed with a brilliant storyline that explored the nature of censorship, which made heavy use of the then-still-recent Nazi book burnings and ended with the local library going up in flames. Coincidence that two of the top five newspaper strips both ran anti-comics censorship plotlines in the same year? I don't think so. In conclusion, 1948 was the year comics were shrunk, stripped of plotlines, and censored, as part of the push to make comics for kids only. That's why I say 1948 was the end of the Golden Age of comics. Exfanding Your Horizons Turns 2 Years Old!